A good pair of shoes can retail for over $50 for kids and way more for adults. Spending that much on shoes makes me ill and is something I refuse to do. Instead we still get those name brand shoes and pay a fraction of the price. Having 14 feet in the house, we’d be broke if we didn’t know some tricks to save on shoes! This is a big tip for all clothing and accessories! You’ll save a ton when you shop end of season sales. Get flip flops for $1 or less in September and buy new boots in April. The older your kids get you’ll be able to guess sizes right for the next season. For adults, this should be simple. Shoes are one category to stay away from cheap brands, especially for kids shoes. You don’t want to purchase new shoes every few weeks, so pay a tad bit more and get a pair of shoes that can handle everything you throw at them. Skip the $3 new shoes and pay for brands you trust. Don’t worry you can still save on name brands, but this means you’ll save two fold since you get a discount and shoes that will last a lot longer. 6pm.com – different daily mark downs on top brands like Ninewest, Ugg, and more. Watch for deals on your favorite brands. Zulily – have different deals each day for kids and women. Watch for regular sales on crocs and Toms along with many other top brands. While I recommend good brands, it doesn’t mean that they have to be new. Check out sites like ThredUp.com and other consignment stores both locally and online to find very gently used shoes. I shared a few weeks ago how we get all of our shoes from ThredUp. I’m serious, these come barely looking worn and I’m thrilled to have Stride Rite shoes for less than $10 (reg. crazy amounts). Getting shoes that will hold up saves money by allowing multiple kids to wear them. Since we have 5 girls (no boys) everything becomes a hand-me-down. A key to being able to hand down shoes is to teach your kids to take care of them! Dress shoes are taken off and promptly put away in the closet. We live on a farm so each kid has a pair of muddy boots, that’s the only pair of shoes mama ever wants to catch you wearing out in the fields. It’s okay to have shoe rules, you are really teaching them to take care of all of their possessions.This doesn’t just apply to kids. It’s time to ask all your friends their shoe size. If you have a dress that needs a special pair of shoes DO NOT head to the store and buy a pair of shoes you’ll only wear once or twice. Borrow them from someone! Let’s make Facebook worthwhile, and borrow/lend what folks need. 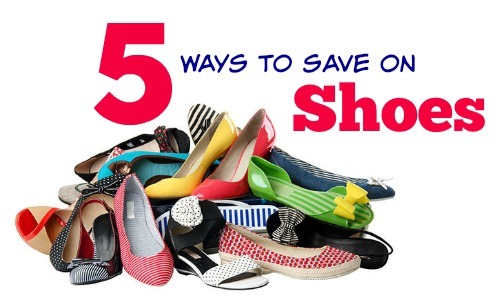 Do you have any other tips to save on shoes?